There can't be too many superheroes who can shatter a vase using only their mind. 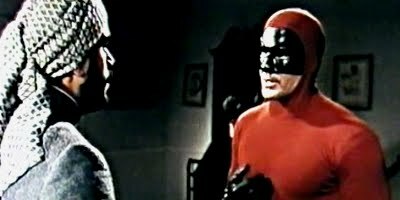 This awesome power, plus the ability to stop people decapitating him with an axe using nothing but an intense stare make Superargo the only man able to foil the incoherent scheme of a rather effete master criminal plus his army of lobotomised athletes. Paolo Bianchini's addition to the Italian superhero genre lacks Diabolik's elan and The Fantastic Argoman's ability to find a woman's cocktail cabinet, but the Jaguar-driving champion wrestler still provides a solid, tongue-in-cheek action hero. Given the inherent absurdities of the genre, Superargo and the Faceless Giants is a little too staid to be a real romp, and lacks a memorable villain, but there are still some memorable moments. Standout scenes include Superargo foiling an attack of the titular giants by throwing a tree trunk at them, Tex Avery-style, and the hero's mystical Indian guru screaming like a girl as he falls into a pool of quicksand.